Given special care and hand-selected by local florists, gourmet foods may include crackers, cheese, nuts, confections, savory gifts, teas, or coffees. Each basket is a one-of-a-kind creation. Exact basket, gourmet selection, and wine will change by designer's choice. Photo shown online is a representation only. Your choice of Red Wine or White Wine. Arrives in a stylish basket, ready to be displayed. During checkout, please be sure to indicate your preferred occasion when you choose a gift card. Exact contents of the basket will vary depending upon location and availability. 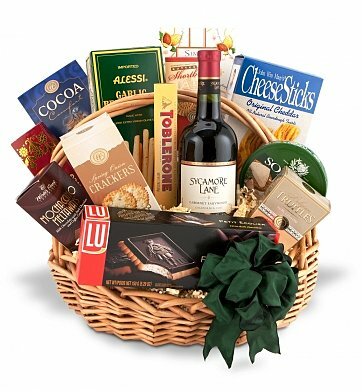 Traditional Wine and Gourmet Basket is a hand delivered gift. These gifts are delivered by one of our local design centers located throughout the United States and Canada. Same day delivery is available for most gifts when ordered before the cutoff time. The cutoff time for Traditional Wine and Gourmet Basket is 12 PM in the recipient's time zone. An option of red or white wine was available during ordering. However, when I tried to change the wine from red to white when placing the order I was unable to do so. That was a disappointment since the recipient prefers white wine. The rest of the contents were great and much appreciated. I purchased this basket as a b-day gift and requested same day delivery on a Sunday. My friends received it on time and loved it. Great service! My husband and I sent my father a gift basket for fathers day......he kept saying how beautiful and good it was. Perfect gift for the Dad who has everything! I send this basket to my Dad for his birthday and he absolutely loved it. It is the first time I have used GiftTree and was very impressed with their selection and delivery options. I will be using this company again.